A fifth of adults smoke - a figure which has remained steady in recent years after decades of rapid falls. Both steps have been under discussion for a number of years with legislation to ban the display of tobacco products put in place by the Labour government before it lost power last year. The coalition had initially said it wanted to review the plan before proceeding. A number of countries, including Canada, Ireland, Iceland and Finland, have already introduced similar bans, while Scotland, Wales and Northern Ireland are moving in that direction. Bans have been imposed on tobacco advertising and smoking in public places in recent years. 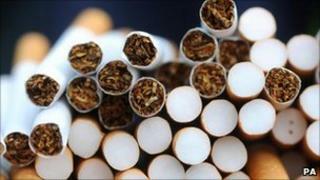 The age at which people can buy cigarettes has been increased from 16 to 18. Later this year, tobacco products will be taken out of vending machines - and now ministers are seeking to ban displays in shops and, perhaps, force manufacturers to use plain packaging. Smoking, it is fair to say, is probably the most regulated mass habit around. But a quick look at smoking rates explains why the government is taking an increasingly tough stance. In the 1950s, when the link between smoking and lung cancer was established beyond doubt, eight in 10 men smoked. By 1974, 45% of adults were smokers and this continued to fall until it dipped under a quarter in 2001. But since then the numbers have started levelling off. Some 21% of adults still smoke, with manual groups twice as likely to do so as professional groups. But if England goes ahead with the plan to force tobacco companies to put cigarettes in plain, unbranded packets it will be the first country in Europe to take such a tough line. Australia is due to introduce the measure in 2012. The plain packaging measure is only a proposal at this stage and will be put forward for consultation. Campaigners believe it will make purchasing cigarettes less appealing and enhance the effectiveness of health warnings. Both measures have been set out in the government's tobacco control strategy, which marks the start of the publication of a series of public health plans. Separate strategies on alcohol and drugs are expected in the coming months. The strategy - unveiled on No Smoking Day - also sets out "national ambitions" to reduce smoking rates from 21.2% to 18.5% by the end of 2015, with specific targets for pregnant women and 15-year-olds. Health Secretary Andrew Lansley said he wanted to see the numbers falling faster in the next five years than they had in the past five. "We want to do everything we can to help people to choose to stop smoking and encourage young people not to start smoking in the first place. We will help local communities to take a comprehensive approach to reducing smoking so we can change social attitudes to smoking." Martin Dockrell, of the campaign group Ash, praised the government for its plans, saying there was "strong evidence" they would stop people taking up smoking. On banning shop displays, he added: "Regular smokers know what brand they smoke before they go into the shop and don't need a display to remind them. In truth, these displays serve two functions - they promote brands to new young smokers and they trigger sales to people who did not intend to buy. Every morning when the ex-smoker goes into a shop to buy a paper the tobacco companies are waiting for them, putting their brand in front of them." Shadow public health minister Diane Abbott said she welcomed the moves, but said they were "building on" what Labour had done through its anti-smoking legislation, including the ban on smoking in public places and on the advertising of tobacco products. But not everyone is in favour. Tory backbencher Philip Davies described the plain packaging plan was "gesture politics of the worst kind" and would represent a "triumph for the nanny state". Industry groups also reacted with anger with the Tobacco Manufacturers Association saying there was "no credible evidence" it would work. The National Federation of Retail Newsagents (NFRN) described the display ban as a "betrayal of our nation of shopkeepers", while smokers lobby group Forest said it would "discriminate against law-abiding consumers". And Debbie Corris, of the Tobacco Retailers Alliance, added: "If anything, plain packaging will cause a problem with more counterfeiting - plain packets are not that difficult to copy - while banning displays will hit smaller retailers hard. We are disappointed about this." Would you buy Brand X cigarettes?